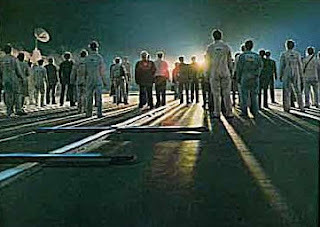 Aside from being a great science fiction picture, “Close Encounters of the Third Kind” is one of the most evocative tales of obsession ever to be etched on celluloid and as such, this is as much a review of the film as it is a reflection on this writer’s personal obsession with the picture that has not abated for some thirty or so years. On a crisp Winnipeg winter night in December of 1977, as I floated in a daze from within the warm confines of an old 2000-seat downtown picture palace called the Odeon, my eyes looked immediately to the Heavens. A typically clear mid-western prairie sky presented a dazzling display of the cosmos – stars danced and twinkled above me and it was near impossible to shift my gaze from the limitless expanse of the universe and beyond. I kept watching the sky for some time in total bliss and ignorance of the sub-zero temperature that, as per usual, threatened to freeze exposed skin in less than a minute or two. I had, of course, just seen a preview of Steven Spielberg’s “Close Encounters of the Third Kind”, a motion picture of such staggering power that it seemed perfectly fitting that my first helping of its magnificence be within the cavernous expanse of this classic theatre built in 1907, its screen enveloped by a mighty proscenium, sitting in plush seats surrounded by an interior rich in ornate white Italian marble and bathed in a flickering light of utter magic that was, at this early stage of my life, a picture unlike anything I had ever seen before. This one screening proved to be so epiphanous that on the first theatrical release of the picture, I saw it on a big screen – in this same cinema – well over forty times. I simply could not get enough of the picture. I needed to see it as much as one needs nourishment. A week could not go by that I did not feel the mysterious pull of this extraordinary motion picture. By now, everyone knows that this classic motion picture charts the journey of everyman Roy Neary (Richard Dreyfuss) who experiences the unexplained appearance of something other-worldly and abandons his life, his job, his family – everything he holds dear – to obsessively track down the meaning behind this occurrence. In a tale steeped in Judeo-Christian resonance – from Moses to Christ – Roy makes a perilous journey, climbs Devil’s Tower and comes face-to-face with the answer to his visions until he, along with twelve apostolic “pilgrims” ascends to the Heavens, arms outstretched in what is surely the most benign crucifixion image imaginable. It’s quite perfect, really. Aside from the obsessive quality of the central character, the picture itself is relentless in its adherence to the basic principles of UFO-ology and a system of extraterrestrial classification as posited by the late astronomer Dr. Josef Allen Hynek – the close encounter. According to Hynek, a close encounter of the first kind is seeing unexplained phenomena, while the second kind involves hard proof of some sort of physical manifestation from what was originally witnessed and, finally, the close encounter of the third kind is contact. Using this classification system as the basis for his screenplay, Spielberg fills in his story with a sound and compelling three-act structure – one that is so exquisitely classical and presented with such flair, that the experience of seeing the film is not only entertaining, but frankly, borders on the spiritual. This sense of spirituality is almost divine in nature and makes perfect sense considering Hynek’s own belief in the notion that a technology must exist which blends both the physical and psychic. Spielberg believes this too, but his approach is that of a master showman imbued with the innocence and wonder of a child. This, finally, is what makes “Close Encounters” such a supreme entertainment – we’re engaged and dazzled, finally, by the sheer physical beauty of what Neary sees, but also, we feel and perhaps even understand what HE feels. Over the years, Spielberg has tinkered with various cuts of the film. After the initial theatrical release, he issued a “special edition” in 1980, which trimmed a few bits that needed trimming, but he also cut several key moments that contributed to Neary’s humanity and his relationship with his family. This was, frankly, a mistake, but an even more egregious error was taking us beyond Neary’s walk onto the Mother Ship, but inside as well. This version comes close to destroying what was almost perfect. Years later, Spielberg rectified the situation by restoring the film closer to the original release, dumping most of the new footage (and thankfully, ALL of the interior Mother Ship footage). All three versions are presented on Sony’s exquisite Blu-Ray and watching them back-to-back provides an extremely rewarding look at a great artist’s process at trying to “get it” right. On one level, the third version from 1998, is probably the best version of the film, but for me, it’s hard to separate myself from the slight raggedness of the 1977 version. It’s the version that first obsessed me and I feel that ultimately, even its minor flaws weirdly contribute to the picture’s enduring, obsessive quality. Steven Spielberg is unquestionably a born filmmaker. He’s delivered some of the finest entertainments we’ll ever see in this bigger-than-life medium, but ultimately, it’s “Close Encounters of the Third Kind” that will probably resonate with the greatest power in the decades to follow. After all, it comes from a special place. It comes from the heart – that mysterious, delicate muscle that pumps lifeblood and seems, more so than the mind itself, to harbor the soul. It’s what makes great pictures and “Close Encounters of the Third Kind” is nothing if not great.